Thank you for your passion toward protecting our soil. This petition has now ended. Over 200,000 European citizens signed the 'People4Soil' European Citizens' Initiative (ECI) calling on the Commission to propose a common framework for soil protection to be applied by the member states. This is a starting point to push our politicians to change national policy and to encourage our representatives in the European Parliament to advocate for change on the European level. Soil is one of the most strategic resources of Europe, as it ensures food security, biodiversity conservation and climate change regulation. It's time to protect the soils of Europe. Main objectives: Recognize soil as a shared heritage that needs EU level protection, as it provides essential benefits connected to human well-being and environmental resilience; develop a dedicated legally binding framework covering the main soil threats: erosion, sealing, organic matter decline, biodiversity loss and contamination; integrate soil related UN Sustainable Development Goals into EU policies; properly account and reduce greenhouse gas emissions from the farming and forestry sectors. Each passing minute, the soil is assaulted, suffocated, contaminated, exploited, poisoned, mistreated, and depleted. In Europe, there is no longer a specific law that protects the soil. 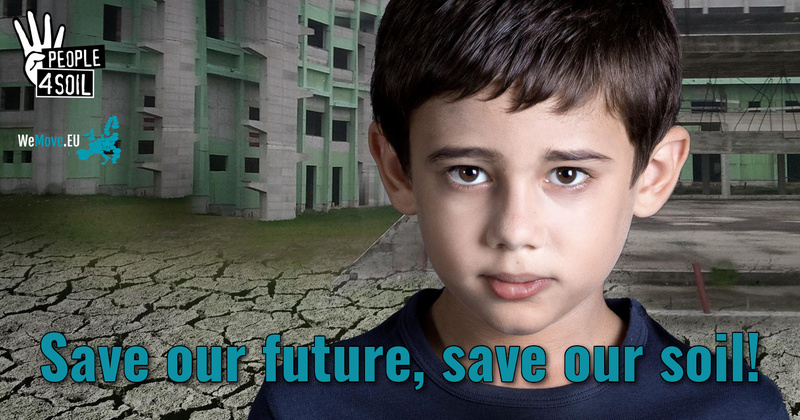 More than 150.000 Europeans signed.You can add your voice until Tuesday, 12th of September! Safeguarding the soil with laws is on of primary ways of protecting people, plants, and animals. Without healthy, alive soil, there is no future. Healthy, alive soil protects us from environmental disasters, from climate change, from poisons all around. More than 500 associations have joined together as part of the People4Soil  coalition which asks the EU for specific regulations to protect the soil, which is as essential to life as water and air. Save soil with your signature! People4Soil is a free and open network of European NGO's, research institutes, farmers associations and environmental groups. What is a European Citizens' Initiative (ECI)? European citizens have the right to recommend EU legislation via the European Citizens' Initiative (ECI). A European citizens' initiative is an invitation to the European Commission to propose legislation, and to be effective, it must get the support of at least 1,000,000 EU citizens, coming from at least 7 of the 28 member states. We have 12 months to gather 1 million signatures in all of Europe. We will be collecting signatures from now until 12 September 2017.
Who can sign the ECI? Every citizen of one of European Union's member states, who has the right to vote in the election to the European Parliament and who is older than 18 (in Austria older than 16). Your government decides what information you need to provide for your signature to be valid, and will use this information to check your signature. The data required can include name, address, date and place of birth, nationality and, for several member states, a personal identification number. Hosting a European Citizen Initiative is much more expensive than our normal campaigns. For instance, the European regulation require us to collect the signatures with an advanced encryption system on a dedicated server used exclusively for that purpose. WeMove.EU is funded by donations from thousands of members across Europe. Can you chip in and help make sure we can move fast to win the campaigns that matter to all of us? You can make a secure donation on the right to help up cover the cost of this important campaign. Soil is a precious resource that feeds all of us. Industry, over-farming and pesticides are a constant threat. We demand the EU to safeguard our soil. Sign! Thank you for taking action to protect our soil! If this is your first action with us, you will receive a thank you email asking you to confirm your email address. You need to click 'confirm' for your action to count. For us to have an official hearing in the European Parliament and the European Commission consider whether to introduce a law, we need a million signatures. That's why we need your help: please share this initiative with your friends and family. Protect our precious resource. Add your signature! There’s a part of our world that is crucial to all life on our planet, but one we don’t think about very often - soil. Soil is a precious resource that feeds the planet but is under constant threat from industry, over-farming, pesticides, urbanisation and the loss of biodiversity. Despite its huge importance, incredibly there is still no common law in Europe that protects our soil. Safeguarding soil is necessary to protect people, plants, and animals. In short, all life depends on healthy soil. Without soil, there is no future. We, the citizens of Europe, ask the European Union to protect soil from cement, from pollution, and from speculative interests. With us, more than 500 associations from all over Europe make up the "People 4 Soil" coalition. We demand the European Union to protect soil by using a European Citizens initiative, the official EU tool for citizens to call for new laws. It requires more information from you than a normal petition because of the strict rules laid down by the EU. Can you help us by adding your name to the citizens initiative? ADD YOUR NAME: https://act.wemove.eu/campaigns/people4soil Thanks!